Husband Art has often remarked that one of the things that attracted him to me was I was very even-tempered, but tilted toward being happy. I would say that is accurate. But much of life is routine, serving to neither raise a person's spirit nor dampen it. One of these is collecting the daily mail. The late commentator Andy Rooney used to say he had long ago given up on the idea that anything wonderful would arrive in the mail. That’s pretty much the way it is with me. Email and texting have almost eliminated my looking with anticipation to any communications the mailman may bring. Fliers and bills are the usual fare. There are exceptions. My hometown newspaper and the nearby weekly are always welcome. In mid-March, a beautiful wedding invitation from my oldest niece was there to greet me. A couple of weeks later, her sister’s graduation announcement came. But most days, the materials are rather mundane. So when I arrived home in the dark after working late one day last week, I stopped to gather the mail with little expectation. I pulled up close to the mailbox to retrieve what was inside because it had been raining and I didn’t want to drop anything on the ground. But this was not an ordinary day. When I looked inside, there, nestled on top of the usual items, were two small daffodils - one with a stem and one without. I had an idea who they were from. We have a couple of little neighborhood girls - one named Nora and her playmate whose name I don’t recall - who occasionally leave small treasures in our box. I put the stemmed flower in a small vase decorated with the bright yellow flowers. I had purchased the vase in Wales a couple of years ago and, since the daffodil is the flower of Wales, it seemed appropriate. It remained in full bloom for days. I placed the one without a stem in the drink holder in my car. It wilted quickly. Still, it made me smile too. These gestures made me think how seemingly small things can brighten our outlook. One day a couple of weeks ago, I was walking from my car to my campus office, when I saw a squirrel nibbling on a nut. It was sitting on an oak-tree branch about six feet above my head. I was weighed down with a bag, a three-ring notebook and my purse and it would have been easy to just walk on. Instead, I decided to stop to take a photo. Squirrels are usually pretty jittery, so I expected my little friend to quickly leave, while I put my purse and other items on the sidewalk to free my hands. But he must have known I meant him no harm, for he just kept eating and watching me. After a couple of pictures, I picked up my things. At that same instant, he left in a flash. But that intersection of our lives somehow amused me. With spring trying hard to make its presence known, other omens of warmer days to come have served as pick-me-ups. As the snow and ice melted, it wasn’t long before our tulips, irises and day lilies started poking up through the soft ground. Art was the first to notice a small patch of bright-red tulips that appeared where our garden had once been. Almost overnight, our forsythia bushes “sprouted” small yellow buds. My colleague and friend Steve has a laugh that can be heard throughout the hallways of our department. Whenever I ask how he’s doing, he’ll quip, “I’m happier than a hog in fresh mud” or something similar. These amusing retorts always make me smile. Like the flowers in the mailbox, his responses somehow make an ordinary day just a bit less ordinary. When comedian Dave Letterman hosted his late-night TV show, he had a segment called “Is this Anything?” The curtain would rise and there would be one or two people doing something a bit quirky or out of the ordinary. Then the curtain would fall and Dave and bandleader Paul Shaffer would give their reaction as to whether what had just been witnessed was “anything.” That evaluation was an expression of their emotional reaction to what they had just seen. In much the same way, from the flowers in the mailbox to the happy pigeon, these little vignettes of life are really nothing. Top-left: one of my dreary-evening mailbox pick-me-up blooms; bottom-left: an earlier work by Nora. 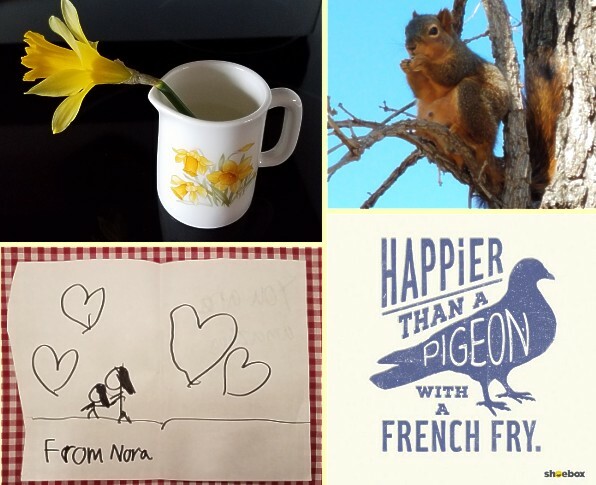 The "You are amazing" can barely be seen below the two hearts at the right bleeding through from the reverse side; top-right: my squirrel "posing" for me; bottom-right: a Shoebox brand version of the pigeon with a french fry greeting card.